God gave the Israelites a new leader. HIs name was Joshua. Joshua marched his army to the great city of Jericho. He wanted to capture this city - but it had high stone walls and heavy wooden gates. "March around the walls of Jericho for six days, in silence," God told Joshua. "On the seventh day march around the city seven times. 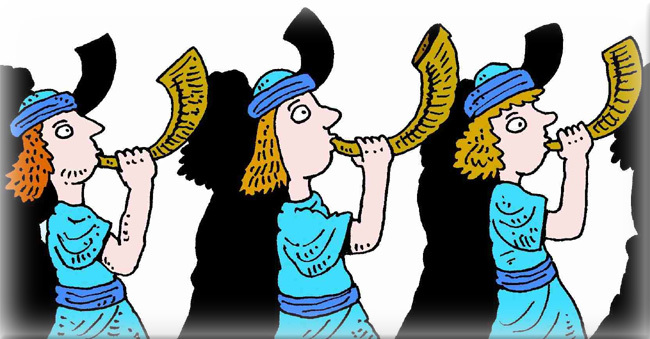 Then blow your trumpets and shout as loud as you can!" 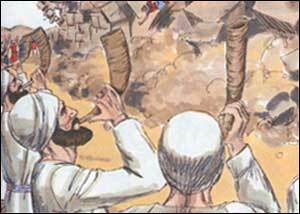 The Israelites did just as God told them - and the seventh time on the seventh day, the city walls collapsed. God gave Joshua the great city of Jericho.